Colds are caused by viruses, and are spread by the germs of coughs and sneezes, according to the NHS. Symptoms tend to come on gradually, although they may last longer in children. Muscle aches, sneezing, fevers, and a loss of taste or smell are all signs of infection. But, you lower your risk of infection by taking Echinacea supplements, scientists have claimed. Echinacea is a North American herb that could help to prevent the common cold. 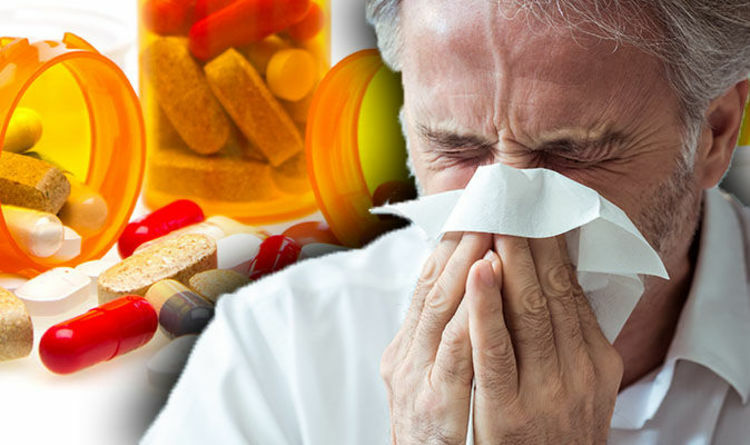 The herbal supplement could lower your risk of catching a cold by up to 58 per cent, according to scientists at the University of Connecticut. It could also reduce the duration of a cold by about one and a half days, they claimed. “The take home message from our study is that Echinacea does indeed have powerful cold prevention and cold treatment benefits,” said lead author, and Assistant Professor of Pharmacy Practice, Craig Coleman. The herb is made up of essential oils, flavonoids and vitamin C.
It works as an anti-inflammatory, which reduces bronchial symptoms of cold and flu. Echinacea could also be used as a painkiller and a laxative, it’s been reported. Patients should aim to take 1,000mg of Echinacea, two to three times a day. Common colds can usually be treated without seeing your GP, the NHS said. The infection tends to last no more than two weeks. To help your chances of getting better faster, get plenty of rest, drink plenty of water, or gargle salt water to relieve signs of a sore throat. A pharmacist can advise you on the best treatments for getting rid of a cold.